The protest action in session yesterday. This is the fourth week of the GTU-spearheaded action which followed on the heels of the TSC’s move to appoint a teacher thereby disregarding an injunction filed by the GTU in the High Court to prevent the TSC from appointing teachers until a review of the teachers’ promotion process is done. The injunction filed by the GTU had also called on the Ministry of Education’s Schools Board Secretariat to also halt its promotion process. Although the School Boards Secretariat had adhered to the request of the GTU, the TSC was not prepared to do so, at least not for the 2015 promotions. TSC Chairman, Ms. Leila Ramson, had indicated that it was not feasible for a review of the thousands of applications already processed. She related that the ongoing court matter is one that has also stalled senior promotions for 2016. The move by the TSC to undermine the injunction and appoint a teacher, forced the GTU to challenge the TSC which resulted in a move by the TSC to rescind the appointment and issue an apology to the GTU. However, this was not enough to appease the GTU which has since been calling on Government to replace the Commission which is headed by Ms. Ramson. 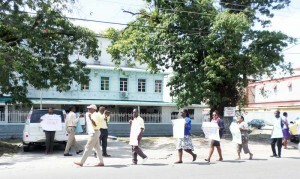 Protesting yesterday were GTU President, Mr. Mark Lyte and General Secretary, Ms. Coretta McDonald, representatives from the Union’s branches and teachers from the West Demerara, Berbice and Georgetown areas. According to Lyte, for the past 20 years, some teachers have been frustrated since they are convinced that promotions are not based on their eligibility and on the criteria that should be used. And Lyte said that strike action, whereby teachers will stay away from school, could start as soon as next week if there is no favourable response.